Unfortunately for Jay Powell, labor statistics are at best backward looking and often just plain misleading. Can you imagine if the wage data contained with November 2018’s payroll report had been released last December instead? Today, pretty much nobody cares anymore. We’ve flipped from inflation hysteria to inversion unease and that was always the appropriate direction. Average hourly earnings increased 3.2% year-over-year last month. Obviously, once again that was the highest increase in almost a decade. Other than October, the last time BLS data counted 3% hourly wages was May 2009. The 6-month average for the volatile series is pressed right up against 3% (still just short). And it’s just as unimpressive now as last month and the month before. 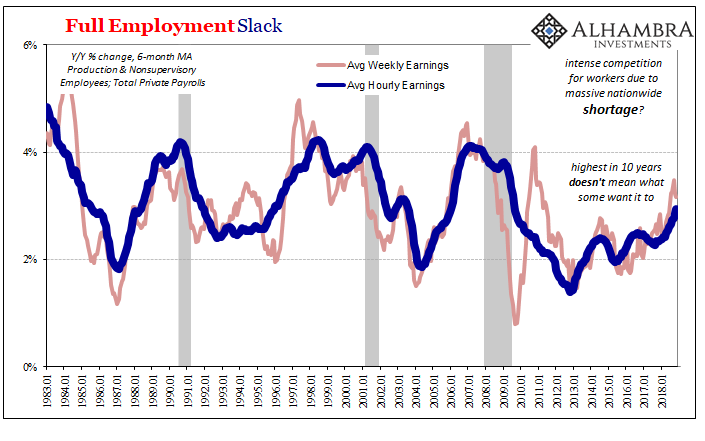 The only way 3% is good is if the labor market is on its way to more normal 4%, or, which would be consistent with a labor shortage of the sort that has been described over the last year or so, 5%. Just passing 3% while the unemployment rate has itself been 3.7% for three straight months is, again, remarkably unremarkable. That’s why, ultimately, markets and even the media don’t really care as much about this one data point as they did previously. Everything here is being superseded by events elsewhere. Maybe if the economy kept going in its low-grade upswing for a few more years we could see 4%, but the chances of that happening diminish by the month, even by the day. Because of inversion, several of them, actually, many are now forced to confront a more realistic interpretation of the economy – starting in the labor market. It hasn’t really been all that good in 2018, only slightly better than 2017 which was a pretty bad year for American workers. It is nowhere near what would legitimately be classified as an economic boom. 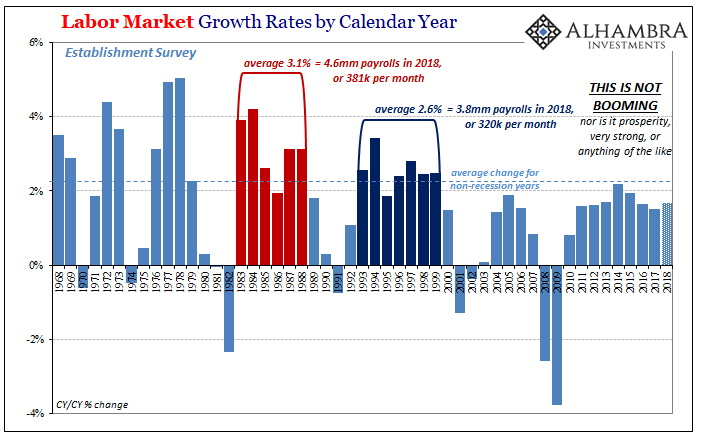 Payroll growth so far this year is decidedly less than 2014, and the supposed “best jobs market in decades” during that year was no match for Eurodollar #3.